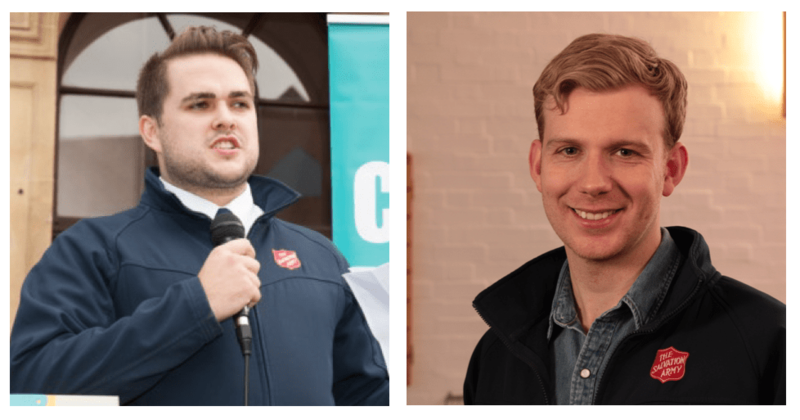 by Captain John Clifton (Ilford Corps) and Lieutenant Ben Cotterill (Keighley Corps) People become Salvation Army Officers for different reasons. For some, it’s because God wrote it for them in the sky. For others, it’s because they were inspired by other officers, often parents making a difference in the world. For others again, it’s because something finally gave way after fifteen years of running from the call whilst others took heed of these all too common Jonah-like testimonies and said ‘yes’ in a heartbeat! But it’s rumoured that this September’s intake of Cadets (trainee Salvation Army Officers) will be particularly low, possibly the lowest ever. A simple comparison shows that in 1990 there were 1,793 UK active officers, in 2000 there were 1,539 and the most recent stats for 2017 show there are 1,042. The following table shows the rate of decline in cadets being even steeper in proportion to the astonishing decline in our soldiership membership. With more people retiring than being commissioned there will of course be implications; officers running multiple corps/centres, retired officers being called on to undertake active appointments, corps/centres un-officered, crucial roles in departments and other jobs led by people who may not even be Salvationists or Christian to name but a few. Salvation Army officers are afforded the wonderful privilege to be released from secular employment to focus on leading the mission of The Salvation Army. However, when officership was instituted in Victorian Britain it was the norm for people to stay in their job for the entirety of their working lives. Today, “job hopping” and having numerous careers in a working life are now the norm although this trend has apparently slowed since the financial crisis. Furthermore, as the membership of the Army increasingly leaves ‘darkest England’ well behind and joins the swelling middle-classes, home ownership, often changing jobs and settling down has become the norm. The idea of committing to one vocation and being told where in the world to live does not fit comfortably into this norm. At the same time our multi-cultural diversity has not been reflected in the cadets at training college. Well, it has rightly become recognised as being one option in a marketplace of vocational choices. Another healthy development is that it no longer receives higher kudos than other vocational choices. It seems also that there are good numbers of people who are deeply committed to the mission of the Army who are seeking out opportunities as full-time employees, with specialist niche roles, as opposed to generalist ministries. There is generally a healthy understanding of the ‘priesthood of all believers’ in The Army. We know about the immediacy of God’s grace and that its not the role of an Officer to administer salvation. However, sometimes we forget that we still require people to fulfil particular functions in the life of the Church. We still need people set apart for the task and vocation of leadership. It’s important to celebrate all avenues of leadership, including Officership. How we hold these trends in tension with the need to develop leaders of our mission is a challenge. It is really positive that non-officers are released into pioneering ministries and specialist roles, but not every corps can produce capable local leaders at a given point in time and will need officers. So, has God stopped calling people? If yes, what does this mean for us? If not, why are numbers so low? Are people saying “no” or ignoring their call to serve as officers? The reasons for this we believe are many: waiting for a spouse to ‘get the call’; being put off by bad officers; confusion over what constitutes ‘calling’; being hurt or seeing others handled badly by the Army; feeling inadequate as a leader; theological and faith issues; a reluctance to lose their autonomy; a sense that the ship is sinking so better to find a new sea worthy ship outside of the Army. We could go on. Now we’re not suggesting that every person with a hint of leadership skills, social competence and desire to serve God should necessarily be an officer. After all, we need local leaders. But we’ve met too many people over the years who are called but don’t take the next step. Between us, we have nine years experience as Officers. This is more than some, less than others. For our generation, that’s quite a long time in any job. What we have seen tells us that God has more to do with our Army. We’ve seen families come to know Jesus. We’ve seen people arrive as refugees from warzones and receive a warm welcome in our churches. We’ve got to know people on first-name terms, from those sleeping rough on park benches to those sat making laws on parliament benches. Every day, we get to care for the poor, feed the hungry, clothe the naked, love the unlovable, and befriend those who have no friends. We’d love for every Salvationist (and every Christian?) to ask themselves whether God is calling them to be a Salvation Army Officer. We are convinced if people opened their heart, then more people might make the seemingly outrageous decision to offer themselves. We want the best leaders, the humblest souls, world-class intellectuals, straightened-out street brawlers, passionate teachers, recovered drunkards, powerful business-people, public servants, white anglo-saxon, recently resettled refugees – people from all walks of life who are deeply resolved to love and serve God all their days – to step up. Why not you!? Most leaders in The Bible had something wrong with them to start with – murderers, liars, cheats, the mute, the comfortable, the not so special – you name it they’re all in there. Leading won’t be easy. That doesn’t get you off the hook, it’s just something you need to expect. The opposition and challenges are inevitable, but they’re never unbeatable. Tony Blair once wrote that the Labour party created a situation for itself where ‘normal’ people felt inclined to walk away, leaving the manically ambitious and the weird in their stead (now it’s also been said that no-one sane every changed the world!). But it is just so important that this generation brings through obedient, capable and teachable leaders (amongst other things) who continue their adventure in the Army for God’s kingdom. God has not stopped calling and the need is as greater if not greater than ever before. So why not you, why not now? Research by Lifelong Learning and Linkedin outline the trend of job hopping. William Booth wrote ’Darkest England and the Way Out’ in 1890, a vision of Booth to transform society. I think you hit the nail on the head with regards to why millennials aren’t running into the ranks of officership. There are many options today for vocational ministry and being told where to live and what appointments you’ll have is an increasingly tough sell for many. Still, I think some people would find that aspect of officership rather adventurous so it will always attract some. Keeping the ones it attracts is another story. I wouldn’t want to be in SA leadership these days with all these demographic changes. God bless them all. My wife and I tried to become candidates but we’re told that we were not educated enough. We were called by God but refused by DC’s They really need to think at what they are doing. I’m a soldier and live my God but I’m struggling to understand why I we were refused “God doesn’t call the qualified, he qualifies the called “. Many offer and some even get as far as training. But even that far a few are rejected by the army. So those that start in sessions may not be those that are finally commissioned. It’s not only education, that precludes it’s errors in judgement, others actions and if your face don’t fit that still plays a part. If someone offers, don’t only train them but support them where they lack judgement or education. Here in the States, we had a similar problem a few years ago, but not currently. That noted, I see many officers leaving because they get disenfranchised with blatant examples of favoritism, nepotism and sometimes even racism from upper leadership. Combine that with a pay scale that makes many officers eligible for welfare and food stamps, and the calling from God gets drowned out by more enticing job offers. I agree. Too much favouritism and neptotism. Some people picked for marketing, videos, leadership, nice easy corps, etc. You can’t feed you family on the wages. The people who come in for welfare are often earning slightly more than you are, How are you supposed to to your job properly while worrying about your family!?. (I am an officer’s kid in Australia.) Didn’t choose officership for these reasons. I agree with the nepotism. I’ve seen it so many times where the less qualitative officers kid is getting handed a job. It really puts down others. Therefore their only expense is good and that’s when they aren’t eating at or through the expense of the corps. Stephen, was that here in the U.K.? I am so sorry to hear this and as an area candidates officer in the U.K., I would hope that this of thing doesn’t happen. Of course, there is always the need to test a calling, but lack of education is not a barrier a far as I am concerned. It may be different elsewhere! I pray that God will open doors to you that confirm his will in your life. Thanks for your comments guys. Right on. The questions go on without answers it seems. Let me add fuel to the fire… I agree with William Booths sentiment when he said ‘Not called!’ did you say? Not heard the call, I think you should say. We need impassioned leaders who will see things as God see’s them and be compelled. Think about Nehemiah’s testimony. My challenge is to those of us who are officers and particularly Corps officers. Are we looking for likely leaders? Are we challenging our younger and older people to walk the talk ie live out the words we sing? Some of those God will call may not even be saved – yet; do our lives challenge them? are we challenging them directly and showing by example the thrill and privilege of winning souls and seeing God at work transforming lives, marriages, families and communities. Come on – those of us a who are already called and on the march – pick up your step. Get about calling others – deliberately, on purpose! Let’s look at ourselves and dare to believe for change where God has called each of us to serve. Someone said ‘Be the change you wish to see in the world’. Thank you Malcolm, for the other readers let me say that it was our privilege to be your Training Principal and you example and fervour havenever left you even in retirement taking on a task of corps leadership in the heat of the Solomon Islands in retirement. Thank you for posting the EXCELLENT postings from the two U,K Officers who have sparked this conversation. I can’t help but think that the fact that many officers these days refer to officership as a job rather than a calling may be a contributory factor. It’s not an attractive “job” in the normal sense of the word, having no autonomy, placing yourself and your family under the directorship of an organisation, no set hours, no contract, no pension. In my experience, if you are called to Officership then you will never feel complete until you are doing the only thing God put you on this planet for. Officership is not a job it is the fulfilling of God’s purpose for your life. This crisis has grown strong here in Switzerland. And also the discussions about the reasons. But here and also in this article, I ask me, why is everyone looking for reasons outside the Army? Is there no one who is brave enough to ask about reasons inside the army? Take a look, the SA is wether a business which has to be managed (!) nor a Church. It would be fine otherwise. Who want’s not to be in a Church and feel fine? And who want’s not this Church to be strong leaded, excellent managed and prosper (aka rich and strong numbers!?). But we have so many churchgoer (aka Salvationists) with many, many years experience in retreating. Do you really think that this will change without a new birth? We should ask us, if we loosed focus on the will of God and began focussing on our wishes. I hope for the Salvation Army to find her way out of this (darkest) crisis. For sure. The world, Europe, needs this Army, but not as a Church. As a movement conquering land where no one, no Church, has gone before. Some of the sad dest things about some of the comments made is that the Army is not without fault in a number of the areas commented upon. I share you sadness having been an officer for 63 years i all appointments from corps Officer to Territoriall Commander. Including the wonderful privilege to be a National Candidates’ Secretary a Training Princiapl – and Divisional Commander. All extremely challenging and fulfilling, but seventeen years as a C.O. were the best apprecticeship anyone could have for what is often misnamed as “Leadership”. People have seen the appalling way that some officers have been treated by our leaders, me included. No wonder they want nothing to do with officership. It is reputed that Bramwell Booth once warned Territorial Leaders not to establish a Training College next to a Territorial Headquarters because of the bad examples they would see! Amen to that! Well said! I fear, at least here in the US that people see the way officers are treated by command staff and thrown away when they become ill depending on how connected they are to upper level staff. I was dismissed with no word to my comrades and with such a small stipend it barely covered my medications and no follow up for months, and I am White Anglo Saxon I think BUT why does that matter? The fault is in your leadership and it went astray when you put Masons in charge, follow the path. That is all! I couldn’t agree more! Upper leadership is disastrous!!!! 1. What is holding you back from going into officersship? 2. What needs to change in order for you to consider going into officership? 1. What is the main reason for why you left officership? 2. What needs to change in order for you to consider coming back? The answers may vary a lot, but maybe can see come kind of pattern. If we find a pattern we could maybe do something about it. I think you make very good points Silje but I doubt that the Army would ever ask those questions. To know the answers and to act on them may mean a radical change to the Army and my experience with the army, at least in UKIT is that they don’t want to embrace radical change. Thousands of pounds spent and given to an outside, secular agency to look at the army for no discernible change to the ordinary Salvationist, let alone the general public via Fit for Mission. The Army in UKIT is led by comfortable middle class people (mainly men) who are so far removed from people’s real lives. Putting a few beds up in your hall in the winter months is great but those officers still go home to their comfortable homes with very little financial worries. I work full time and I know that I take home less money than a married officer couple and I still have full rent, car, bills etc to pay. I’ve had that conversation with comfortable middle class, middle age officers and at best they’ve been surprised by it, at worse, they have denied it. The Army was started with a passion for God and saving souls, we need to drop the nepotism, embrace incarnational living and win the world for Jesus!! One issue is the traditional mindset of thinking that Officership is still a youth oriented issue. Attitudes, reactions are based on the 19 year old, wet behind the ears, Victorian anyone can do it. God calls and qualifies, yes, but that qualification starts before Training College. Gen Paul Rader had it right when he made appeals for those in later life who could come and be officers. Fortunately those in later years are mature enough to overlook the organisational youth bias. And despite the rejections of people, the dreadful attrition rate of yesteryear has been stemmed. Looking forward, I would also hope that we could do something about the appointment system. Let’s get our heads around the fact that this needs human resource expertise. Having had a couple of really out of the box appointments, I am very unsure of just what those who do the choosing know about either people or the appointments before them. Yes there are anecdotal stories of it working out. However we just don’t hear of those who leave because of the mis-match. And surely the most basic thing is to give people a reason for why they are being appointed. Otherwise it leaves the old impressions of the appointment dartboard! Excellent blog. I wouldn’t argue with any of it. But look at the soldier statistics and note the trend. Continually downwards, on a disastrously steep curve. There has been no sudden crisis, so no specific cause to blame. It’s institutional. Only senior leadership at the very top can make significant changes, but their age makes adventurous, risk-taking decisions unlikely. Top leadership should now skip several generations and be entrusted to idealistic young officers in their 40s, who have a real stake in the future, not an eye on retirement. My husband and I heeded the call but the Salvation Army said no because at the time it was important that we both have a Salvation Army background, even though I was a church going Christian prior to marrying my husband, I was not brought up in the Salvos. Thankfully that is not important any more, but I believe that you should be a Christian for at least 10 years & a Senior Soldier for at least 3 years prior to entering the training college. Went into training too young and unqualified, then was on the wrong side of the ‘old boy’ network. The system of those days did not help, and with no prospect of an education, and being unable to cope we left. The calling does not go away and we serve, though I am still not convinced all officers understand or respect that people other than officers can be called and dedicated. I have also witnessed more recent events that show the organisation still does not know how to manage people. We have so much going for us and yet I see ex Corps buildings now full of people belonging other churches. Something is still wrong somewhere. Someone wrote recently ‘would you like to be your Corps officer?’ perhaps in this lies the answer.